Honestly I'm not sure. You probably just have to ask if they even offer that anymore (it's also entirely possible I'm mixing up my companies). I do remember them being pretty quick with authorizing the RMAs...the shipping thing is what I'm a bit fuzzy on. I hope I'm not getting your hopes up for something they don't do. Don't worry I am only betting the mortgage on my house and my kid's future on your off-the-cuff advice... no big deal, I'll just hold you entirely responsible if you turn out to be wrong. If the board qualifies for the Advanced Replacement Cross-Ship option, then they will inform you and will send the new board out, you won't have to do anything! I'm just unsure if your mobo does or not. Just curious, does the monitor still not work with the laptop or another PC using HDMI? Well it looks like that's a separate problem. Still can't get either monitor to detect digital from my laptop. Only machine I have that works right now, so I suspect its my laptop for some reason unknown to me. I used ones of these monitors with my laptop for about 2 years so I know it worked before, but this is the first time I've tried in a year or so since I gave it to my wife. VGA works fine for both, but DVI or HDMI gives no signal... but the monitor says power save mode like it knows its plugged in, and unplugging digital it then says no dvi/HDMI cable... so it is detecting something just no video? Also according to Asus website my board falls under "limited eligibility" for advance replacement service... wonder what that means? Well at first it appeared like it was one of my 5870's. I got a picture when I took out 5870 Number 1 and stuck 5870 Number 2 by itself. Then I started RMA process for 5870 Number 1. Then I turn on my PC today, and same thing all over again. This time I notice a VGA_LED on my motherboard. I turn it off and back on, and now I only get a 'BOOT_DEVICE_LED' to light up. 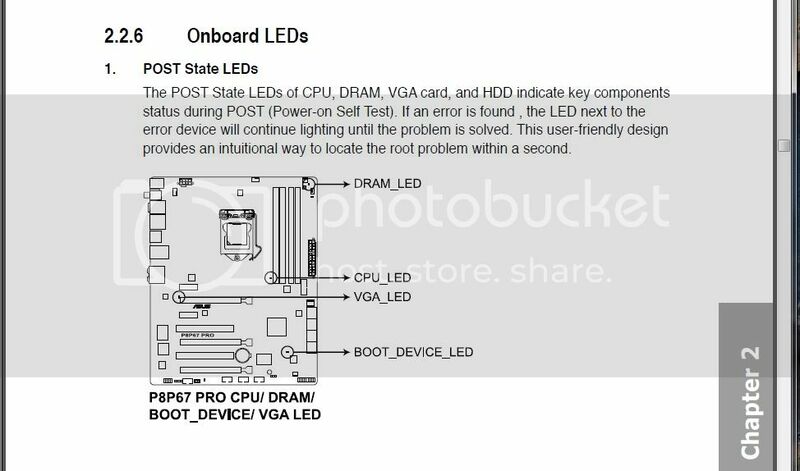 I haven't been able to find much info on this LED, but it seems to me the problem is the motherboard, as two cards can't seem to work in either PCI-E slot. Anyone know how fast Asus handles their shyte? Tried 3 different gpus in both slots, get this led every time and no boot.